Donna Barnes-Roberts Watercolor, Oil Painter, and Acrylic Painter. Explore what oddball stuff she does, including painting, teaching classes, videos of music, and odd art happenings around Altadena and Pasadena, California. Become a Sponsor of My Catalina Island Series! I have been given the opportunity to paint the wildflowers and landscapes of Catalina Island not normally seen by the everyday visitor. Most of Catalina Island is stewarded by the Catalina Island Conservancy, and public access is limited. My gallery, Tirage Art in Pasadena has arranged transportation for me and a select group of their artists to visit little seen parts of the island to paint and photograph for future paintings, but I have to get over there and stay there at least a day or two for maximum effect. Since we live very much hand to mouth, even this modest cost is not in my budget - I don't have the funds to do this now without your help. Time is also of the essence. I received an email late yesterday telling me that the wildflowers are probably at their peak right now, so I am hoping to get over there Thursday and spend one or two nights so I can paint and photograph intensely while I am there. What I am proposing is that you can become a sponsor of my trip for a modest cost - you can donate any amount, but if you donate at least $50, you will get a preview of any of the paintings completed from the trip and the $50 would go towards purchase of any painting of mine, or future class (if that is your preference). All sponsors will also receive status updates as to the trip/paintings/exhibition(s) that involves Catalina Island. If you mail a check, please call me at 626-791-0851 to let me know about it, or email me. I haven't made any reservations yet, and can't really until I have the funds to pay for this. 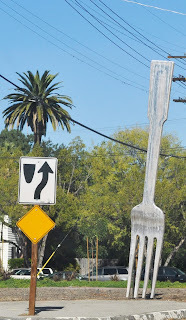 Those of you that know where I teach my watercolor classes (The Coffee Gallery in Altadena) might realize that the phenomenon of the "Giant Fork in the Road at the Fork in the Road" in Pasadena was a stunt cooked up by a quirky group of people that hang out and work at The Coffee Gallery. Since I was not an actual builder of the sculpture of the fork, and have some computer skills, I have been asked to build and maintain the "official blog" of the Giant Fork in the Road. So if you have a hankering to know what is going on with the Fork, just go to the Fork in the Road Blog. I have a varied life that includes more than just making art, and after you read this post, you will realize that I also have friends that are marginal wackos. Just my kind of people. You see, as a birthday prank for a friend, a group of artists and other locals with too much time on their hands worked hard to provide a fitting tribute for a 75th birthday party. And since the birthday boy had wanted to see a fork in the road at the fork in the road where Pasadena Ave. divides into St. John and Pasadena Ave., that is exactly what they built (be careful, the split streets are one way, but Pasadena Ave. south of the split is 2-way). All of 18 feet tall and set in over 400 pounds of concrete, we will find out if the city can live with it or will feel compelled to tear it down. I will be talking a little bit about the fork this coming Saturday, November 7th 2009 on the Off Ramp Radio Show on KPCC. John Rabe of the Off Ramp radio show has blogged about this, and will be including posts of new info as it occurs - there is supposed to be a video, but I haven't seen it yet. Tonight is the last class of the last series of Watercolor Classes - next week I will be starting a new class and there is still room available, so you can still sign up. We meet at the Coffee Gallery in Altadena. I will be having a short Class in November and December, starting the week of November 2nd. Since everyone is going crazy this time of the year, I decided to have the classes during this time be 5 weeks over a 6 week period. Both the Monday Evening Class and Wednesday Afternoon Class will be available on this schedule. We skip the week of Thanksgiving, and finish before Christmas. Since you are only signing up for 5 classes, the cost is lower than usual, just $105 for the series, and if by some miracle you don't miss any classes, I might charge you for the 6th class, or it might just be your Christmas present from me. One of my students got in Watercolor West! 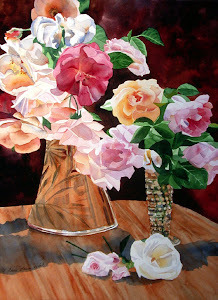 Congratulations, Terry Swanson who will be part of the Watercolor West show at the Riverside Art Museum. She is one of my Monday evening watercolor students. On July 11th at 11AM, I have been asked to lead a short workshop entitled "Sketching in the Garden for Beginners" at the Smith and Hawken store on South Lake in Pasadena. We will be doing sketches with pen/ink, pencil and a variety of color media, to encourage people to really look at what is in their garden. And we will do it on postcards that you can send to your friends or even acquaintances. No pressure - just fun.